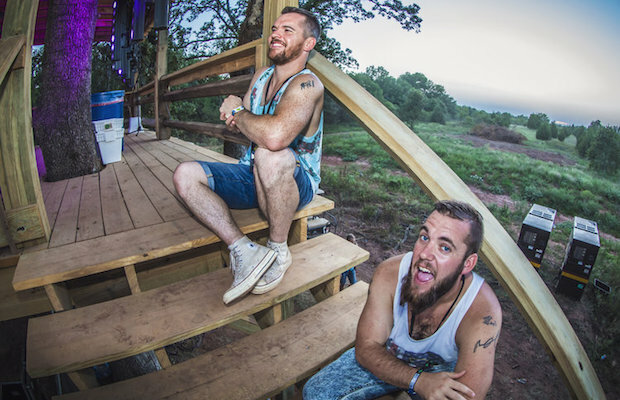 Fans of jam-worthy funk, dance music, and EDM take note, Marathon Music Works is boasting one stacked lineup of unique performers on Feb. 16, headed up by Kansas EDM meets funk and jazz infused brotherly duo The Floozies, who’ve had a huge and buzzworthy couple of years. Tapped for support are buskers turned beloved brass house trio Too Many Zoos, no strangers to Music City, and rising EDM producer Dreamers Delight, all set to bring the party starting vibes and good times with their own respective twists. You can still get tickets right here, but we’re excited to announce that we’re also giving away a pair of tickets to one lucky fan! Read on for more about the show, and enter for a chance to win below. It might sound unlikely that one of the hottest electronic outfits in the country hail from the small, liberal mecca of Lawrence, Kansas, but that is just the case with a pair of brothers, Mark and Matt Hill, who operate under the moniker The Floozies. Unique in their expansive style, the duo’s fresh brand of EDM is built on a backbone of funk, which actually embraces the vibrant Kansas City jazz scene, who brought us Count Basie, Charlie Parker, and the general shift to improv heavy Bebop (the band like to point out that they grew up in Kansas City’s shadow, separated only by wheat fields from nearby Colorado’s flourishing electric scene, and their sound reflects that interesting duality). One listen to the infectious, dance ready tracks that range from funk to hip hop to dubstep show this isn’t your traditional laptop and turntable EDM setup. The Floozies incorporate live elements into their sets with Matt helming the guitar and production, to go along with Mark’s organic beats on drums, and they are also known to incorporate other artists into their live sets featuring horns and other funk inducing instrumentation. The rising popularity of the duo may have originated in the jam scene, expanding with an increasing number of festival appearances, including Wakarusa, Electric Forest, Summer Camp, Camp Bisco, and Bonnaroo, and even nabbing The Floozies a headlining appearance at the legendary Red Rocks- no small feat. Just since last year, the band, who release singles, remixes, and more at a regular clip, have graduated from Cannery Ballroom to Marathon, and we have no doubt they’ll be in an even bigger room before long; see them now while it’s still a relatively intimate party! Formed in 2013 in New York, brass house trio Too Many Zooz began their career busking in the New York subway, fortuitously finding viral fame after being recorded by a passerby. Made up of baritone saxophonist and de facto frontman Leo Pellegrino and trumpet player Matt Doe, who met at the Manhattan School of Music, along with drummer David “King of Sludge” Parks, the band’s unique and self-forged style and electrifying live presence, boosted by Pellegrino’s funky dance moves, has helped them parlay viral fame into actual musical success, leading them all the way to the CMA Awards where they backed Beyonce in 2016, just months after releasing their debut full-length, Subway Gawdz. Much more than a novelty act (though there is certainly a novelty to scaling busking music to a mass audience), Too Many Zooz are a legitimately fun and eclectic live force, and every time they make it to Music City it’s nothing short of a party. The musical alias of Denver based producer Reed Krafft, who worked behind the scenes with other artists for years before stepping out on his own, Dreamers Delight began just in 2013, but quickly found an audience thanks to early buzz, well-received remixes, and an initial deal from Gramatik’s Lowtemp Records. The half decade since has seen Krafft ascend the ranks of the EDM scene, embarking on national tours with the likes of Big Gigantic, FKJ, Sound Remedy, Break Science, and Emancipator, and appearing at fests like Coachella, Electric Forest, Lightning In A Bottle, Camp Bisco, and more. Unique on this bill in that he’s more congenitally EDM and production based, and doesn’t fuse live instruments, Dreamers Delight should, still, bring all the party starting vibes fans of The Floozies and Too Many Zooz are craving. Don’t be late! Winner will be announced Friday, Feb. 15 at 12 p.m. CST, and will receive one pair of tickets. Good luck! Win Tix to The Floozies at Marathon Music Works! The Floozies, Too Many Zooz, and Dreamers Delight will perform Saturday, Feb. 16 at Marathon Music Works. The show is all ages, begins at 9 p.m. (doors at 7:30 p.m.), and tickets are available to purchase for $23-52.